Video poker is actual poker but played at an average slot machine. That is a fine explanation for the person who has no idea about the video poker at all. Hitting the jackpot in the video poker is a bit easier than simple slots. 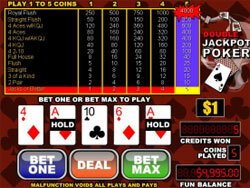 So, what is video poker and jackpot in it? It is a computerized version of a land poker and it is played on a console, which is a lot like a slot machine. The first samples were so simple, that now a lot of people would say how primitive they were. They appeared in the 70s. In the 80s this type of game became so popular with the crowds that the casinos had much profit from it. The players started playing it a lot, as the machine was not as horrible as the live game. None is looking into your eyes. You are all by yourself. One more reason, why it became so attractive for the gamblers, was that the machines were of lower denomination and the odds were way better. You push the button and you are offered to make your bets. Then you press "deal" and the game begins. You are given the cards, which you can discard one or more in order to take other cards from the deck, which is being dealt. After, you can receive the payout according to the combinations, posted in the pay table. What is more, some video poker machines suggest progressive jackpots, which we better know according to the progressive slot machines. Nowadays you can meet these machines in every gambling spot even in casino online. There are many types of video poker you can choose from. Among them is Jacks or Better. Actually it is "Draw Poker," as the idea is the same. Another one is All American. It is just the same as Jacks or Better, but the payoffs are better for flushes, straight flushes and straights. The payoffs are worse for full houses and two pairs. Deuce Wild, Tens or Better, Double Bonus, Bonus Poker, 9/5, 8/6, 8/5, 7/5, 6/5 Jacks or Better and other variants of video poker. You can get a big jackpot, only if it is large enough. Some casinos even advertise their machines, if the jackpot is so high.